Going for a late afternoon walk by the seaside at the Sunshine Coast during the “magic hour” provided me with some cool photo opportunities. The typical conifer trees that are found all along the Australia’s East Coast were already blooming. My son, The Pok, was enjoying a bit of tree climbing (even if he had to get an initial boost from his Dad). He did get stuck a few moments later which came as more of a shock to him. 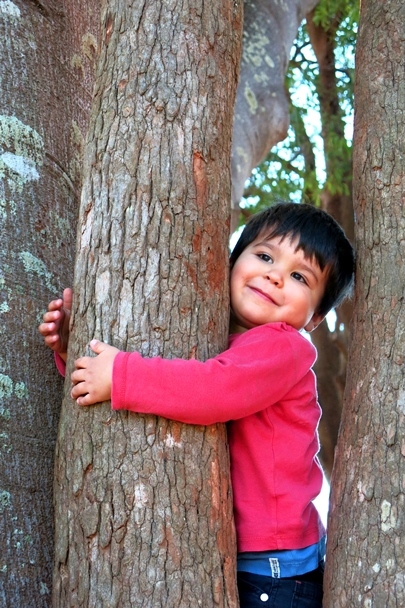 Nothing like a bit of tree-hugging. And the Pelicans were slowly paddling on the surface in search of dinner. I wonder whether they would be affected by daylight savings? I love coming up to this part of the world. LOVE that first shot … so peaceful!!! Out on the water, yes. On land it was a bit crazy with a two year old. hehe … i can imagine! well, at least you got a really great shot from it!!! Remember Chris, those who live with warm sunshine everyday, stop noticing it. You are the lucky one to experience the changes of seasons…..even if it means a bit of cold wet weather from time to time. My English wife is the only half of my marriage that is happy about the cricket result. But one of the reasons she loves living in Australia is the weather. I live just south of the sunshine coast, and can’t say that I stop noticing the weather. I enjoy the winters because the daytime temperatures make me feel like I am in a Scandinavian summer! However, it still gets a bit cold at night, not that I would complain about that. It is the summers here I notice most, terribly unbearable to someone who like the cold, rain, fog etc. But I do agree on the Sunshine coast, it is a lovely place, much preferable to the Goldie! This looks like around the Maroochy river, especially withe the pelicans, am I right? My cousin says the same things about the summers being too hot. This was taken off Golden Beach just South of Caloundra near the very Northern tip of Bribie Island. And I have to agree with your assessment of the Gold Coast. You are fortunate to live in this part of Australia. Ok. It was Caloundra, another lovely spot!